SlimShotz is a berry flavoured weight loss drink that contains glucomannan, and according to the advertising, it will reduce your appetite. Glucomannan is an effective appetite suppressant with very few side effects, so this looks to be a safe and effective method of weight loss. In addition, SlimShotz is conveniently packaged in stick sachets that you just add to water and mix. No comments Published Apr 14, 2019. SlimShotz is a berry flavoured weight loss drink that you make by adding the powder to a glass of water, and according to the advertising, it will seriously reduce your appetite. Use as recommended and the company will give you a refund if you don’t feel the difference in 7 days. This sounds great, so is SlimShotz worth a try? We find out. Primal Cure is a British company based in Redditch. The company’s mission is to support health, wellbeing, and longevity. They also run a program called Double the Goodness, where they provide nutritional support to children in the developing world. SlimShotz is a glucomannan supplement that comes in the form of a berry flavoured drink to be taken 3 times a day, 30 minutes before each meal. It is conveniently packaged in stick sachets that you just add to water and mix, and each box contains 21 sticks so is equal to one week’s supply. It is expensive at £14.99 per week (£59.96 per month), but if you are dissatisfied or find it does not work, you can return it to Primal Cure for a refund. SlimShotz comes from British company Primal Cure and is made in the UK. What are the side effects of SlimShotz? Potential side effects may include abdominal cramps, bloating, nausea, and increased bowel movements. It is important to speak with your doctor before using if you have an underlying medical condition or are taking prescription medication, in case of interactions or adverse effects. How much does SlimShotz cost? SlimShotz is expensive if you are looking to use long term. Many people take glucomannan supplements over a period of months, so do this with this supplement and it is going to be pricy. Buy from the official Primal Cure website and each packet of 21 sachet, and one stick serving costs £14.99. This is sufficient for one week’s use if you take 3 times a day as recommended. Take for a month it adds up to £59.96. You can obtain a reduction by signing up to the “Subscribe and Save” option on the website. This is an auto-ship agreement that sends you fresh supplies, and bills your bank or credit card automatically. The price for this option is £11.99 per box, so it does save money. However, these types of agreement can be tricky to cancel and although this is covered in the terms and conditions, we read through these rules and it all seems very confusing. There does not seem to be a simple “cancel the agreement” option. Delivery within the UK is a further £2.99 (free on orders over £35.00). International shipping is available, but you will need to contact the company first. You can also buy SlimShotz via Amazon for the same price. This works out a little cheaper if you have Amazon Prime, so can benefit from free shipping. SlimShotz is a weight loss supplement that you take as a drink by mixing powder to water. Each serving is conveniently packaged in a stick sachet, so you don’t have the hassle of a large tub or messing about with powder. There is only one flavour – which is just named as “berry”, but looking at the ingredients list, is based on cranberry. SlimShotz contains glucomannan as the principle ingredient. This is a natural fibre derived from a plant called the Konjac, and when added to water or ingested, it swells up to many times its original weight, forming into a gel-like substance. This is effective for weight loss because it causes the user to feel fuller for much longer on less food. Glucomannan is one of the very few natural ingredients approved by the European Food Standards Agency (EFSA) as being effective for weight loss. SlimShotz also contains Inulin, a starchy substance present in fruit and vegetables, and there is also added zinc and vitamin C. Check out the ingredients tab for more information. Primal Cure is a British company based in Redditch near Birmingham. Full contact details are provided, including the telephone number (0800 4402 888). The address is Unit 2D, Eagle Road, Redditch, B98 9HF United Kingdom. Primal Cure looks to be a reputable company with a wide product range of supplements, cosmetics, minerals, and vitamins aimed at improving general health and wellbeing, as well as weight loss. SlimShotz was launched onto the market in August 2018. Glucomannan can swell up in the throat if not taken with sufficient water – the recommended serving of water seems too low in our opinion. Although Primal Cure looks to be a reputable company, the terms and conditions about cancelling the auto-ship agreement seem very confusing. If you choose the Subscribe and Save option, it may be more expensive in the long run than paying full price for this supplement. The company was founded by Steve Bennett, described as an entrepreneur, author, adventurer, and health guru. There is a Primal Cure Live TV channel you can watch on the website or via Sky Channel 670, which offers health advice and the company also takes part in charitable donations with their own Double The Goodness programme. According to the about us information, Primal Cure donate 25% of net profit to improving health and nutrition in the developing world, which is commendable. What does SlimShotz claim to do? Yes, we think it will work. Glucomannan is a proven ingredient that can help weight loss, because it reduces hunger pangs and improve digestive issues. The fibre is good for the probiotics in your stomach – it has a prebiotic function which helps nourish your good bacteria so may improve digestive issues, and because glucomannan is a mild bulk laxative, it can remedy constipation and make you more regular. In addition, glucomannan can help reduce blood sugar levels and cholesterol levels. Most scientific research has looked at a daily serving size of 3000mg-4000mg, the figure that the EFSA has considered optimal. At 5.1mg per day, in SlimShotz, this seems a little high compared to most supplements and is probably unnecessary. Whether SlimShotz will work for you will probably come down to whether you enjoy drinking the shots, and if you can persevere with this supplement. In our opinion, SlimShotz should be an effective but expensive way of taking a glucomannan supplement. Serving size is equal to one stick sachet (4g). Cranberry Fruit Powder (50mg): Mainly here to add to the flavour, cranberry is also well known as a preventative for urinary infections. Vitamin C (250mg): Essential vitamin that the body cannot manufacture. It is only obtainable by diet where it is present in fresh fruit and vegetables. Vitamin C is important for many processes in the body, but is best known for its support to the immune system. Vitamin C deficiency leads to scurvy. Serving size here is safe – taking over 1000mg a day can cause kidney stones if you have a history of this condition. Zinc (5mg): Zinc is an essential mineral but the body requires very little of it (around 20mg a day depending on the size of your body). Zinc is important for numerous bodily functions and for a healthy immune system. It is important to ensure that you add plenty of water to the powder to ensure that it reaches the stomach where it can expand safely, or it could cause blockages. Caution: Not suitable for individuals under 18. Avoid if you are pregnant or breastfeeding. Speak to your doctor first if you are taking prescription medication or SlimShotz may prevent some medicines from working effectively. Ask your doctor for advice if you are taking medication for diabetes, blood pressure or high cholesterol or have an underlying medical condition that could be affected by this supplement. There are customer reviews for SlimShotz. We took a look at the official Primal Cure website and on Amazon where there are a handful of reviews. Gets rid of the hunger pangs for few hours when fasting. Not bad. Does take the edge off. Followed extremely strictly and i can honestly say for me it did nothing!! There is a money-back guarantee and it looks very good. According to the advertising, “Feel the difference in 7 days or get your money back”. The returns address is Primal Cure, the Cave, Unit 2D, Eagle Road, Redditch, B98 9HF. 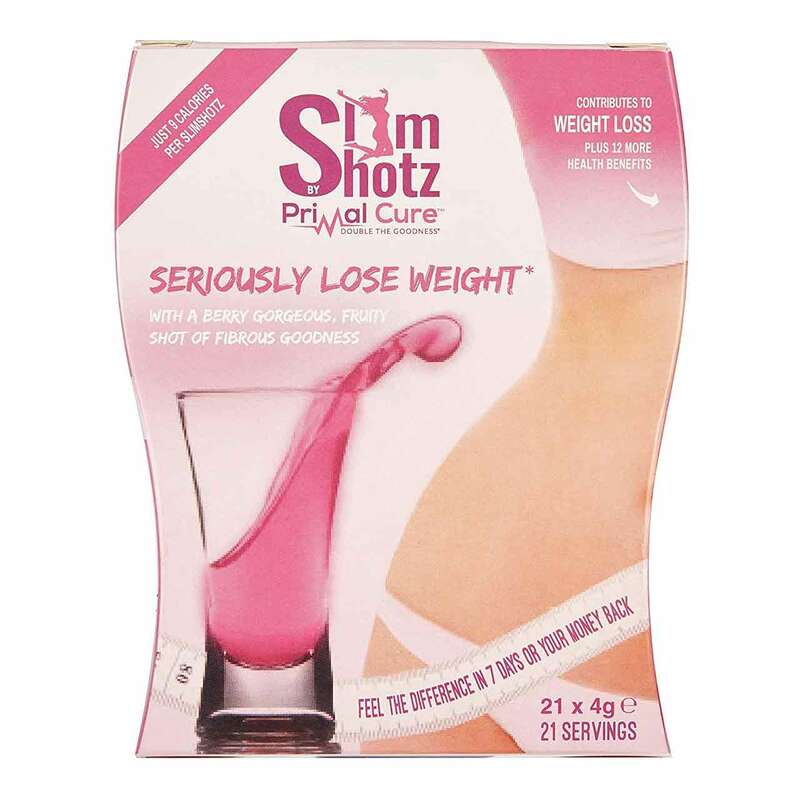 You can buy SlimShotz via the Primal Cure website or TV channel. It is also on sale via Amazon. We are impressed by SlimShotz. 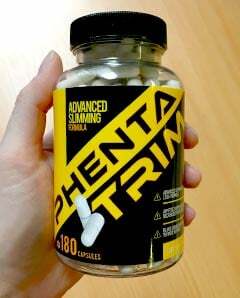 This looks to be a good quality supplement that will probably work as described, and if you can face drinking it three times a day 30 minutes before meals, it probably will help you lose weight. Glucomannan is an effective appetite suppressant with very few side effects, so this looks to be a safe and effective method of weight loss. However, we do have some concerns. There seems to be no real reason why this drink should contain such a high serving size of glucomannan when it is unlikely to make any real difference to the final outcome. In addition, it is expensive if you take it long term, as is recommended by most clinical research. We were also disappointed by the Terms and Conditions which do not make cancelling the Subscribe and Save option very easy. We like Primal Cure and are impressed by this British company, the TV channel, and the charitable donations, but we are less keen on this supplement. 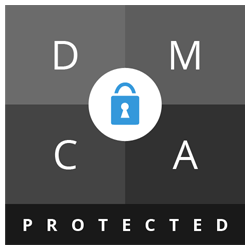 We can see most people trying it for a week and just giving up on it and although it may work for some users, we think it is a bit too fussy and overpriced to recommend to the Watchdog readers. 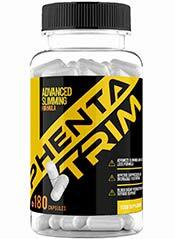 How does SlimShotz compare to Phentatrim?